Good morning, friends! I hope that you had a wonderful weekend. Mr. Bleu and I spent the weekend painting and doing some repairs around the house. I guess you could say we are already in Spring cleaning mode. We have one more project to tackle….cleaning out the attic. I dread that one! Recently, my oldest son moved into his own apartment. He is working and attending college. I am happy for him, but it is hard when one of your children leaves the nest. My mother has always told me that your children are angels loaned to you for a short time. I know now what this means. With all of the recent improvements going on around the house, I have been working with two of my most important clients…my youngest two children. I have had so much fun working with them to create their own spaces. It is so interesting to see their different tastes. They make me laugh at how definite they are about their likes and dislikes. Today, I am sharing with you my daughter Caroline’s room. She is one the sweetest and kindest young ladies you will ever meet. She has such a special place in my heart. Caroline was born with a weak immune system. We didn’t realize it until she was 6 weeks old. She was sick with a fever all the time, and we were constantly at the doctor. Mr. Bleu and I were so scared. Finally, her blood tests revealed that 3 of her immunoglobulins were very weak. No matter how sick she was or how high the fever, she always managed to greet you with a smile. That speaks volumes to the person that she is. No matter how bad things are that sweet girl is always positive and never lets anything get her down. She is one of the strongest people I know. Today, I am happy to report that she is a healthy teenage girl. We just have to be careful when she does get sick. We can’t tarry around. Now for the big reveal….Caroline’s style is a lot different from mine. She loves a more modern, artsy, and contemporary look. There is one thing we can agree on though…we both adore color! Caroline loves coral. So coral it was for the walls! She picked this orange and pink bedding. It is from JCPenney, and she loves it. I have to admit, I do too. Being book ended by two boys, she needs her own special place to retreat to. I created this sitting area in front of her bay window. It is the perfect spot to read a book. She loves to read and has quite the book collection. I surprised her with the chair…ordered from Wayfair. On a recent shopping trip to HomeGoods for accessories, she picked out the pretty pillow. It ties back wonderfully to the bedding. We also found this awesome side table at HomeGoods. She loves its edgy look. Her taste in lamps is somewhat industrial. She fell in love with this one. We perched it on some books for added height. For some added glitz and glamour, Mr. Bleu kindly installed this pretty chandelier. We decided to add a focal point to the room by painting horizontal tone on tone stripes on the wall the headboard is placed on. Not wanting to take away from the stripes on the wall, an architectural piece of white iron was hung above the bed. On a side wall in the room, I hung some of Caroline’s artwork. Not only does Caroline love to read, but her real passion lies in painting. Mr. Bleu and I are working on creating a special place for her to paint and create. Hopefully, we will have it finished soon. Thank you so much for allowing me to share this special girl with you today and the space that we created for her. I hope that you enjoy your day!!! Veronica, thank you for your very sweet and kind words. I hope that you are enjoying your week, and that you have a beautiful weekend!!! Shannon, sweet Caroline’s room is so lovely…she did a great job! When I was nine years years old, my parents built a home and they let me decide my room color and bedding…same wall color as Caroline’s. It is so important to allow your children to be creative and their room is the perfect place. Her artwork is excellent and thank her for allowing us in her beautiful space! Pam, Caroline and I both thank you for your sweet comment. We loved hearing about how you chose the same color as Caroline did. Your advice about letting children being creative is spot on. Thanks again for your kind words. The bedroom is adorable! The striped paint on the walls really created a perfect backdrop. The bedding is cute and makes you feel happy! I did this with my kids. It was interesting to see how they had specific tastes already formed so early in life! Love her artwork! I’m imagining how scary it was with her being ill as a newborn- so glad they figured out what was going on and that she’s doing so well now! Liz, Caroline and I both thank you for your sweet and kind words. We hope that you are enjoying your week!!! Beautiful room reflecting your daughter’s taste. I love the stripe paint that is such a stunning focal point. Her art work is lovely and compliments the floral bedding. The room is a work of art that the two of you put together. I think you allowing her to pick out selections for her room not only taught her about decorating but the two of you bonded in the process which is a priceless experience. Bonnie, thank you for your very kind comment. I hope that you are enjoying your week!!! I LOVE this Shannon! I am a big fan of pink and orange, what a girly and elegant retreat you all have created! The headboard wall is fabulous, and the bedding is perfect with a contrast to her edgy accessories. She does indeed sound very special, and she will love having her own space to paint, read and relax. Thank you, Jenna! I hope that you are enjoying your week!!! What a fun room for your daughter! Thank you, Joy! I hope that you have a beautiful day!!! A most beautiful makeover…I am so happy that your sweet Caroline’s health is much better…I know you must be always concerned when she does get ill…..Love the colors in the room….I was walking by a Michael Kors store the other day and the window display was all in pink and orange!…She is a wonderful artist…so great of you to create a room for her to work!..Great job!! love the room! Shirley, Caroline and I both thank you for your sweet and kind comment. We have been seeing a lot of pink and orange too. I guess it must be getting popular, but I have to admit I do love it! I hope that you enjoy your day sweet friend!!! What a dream of a bedroom! It is the perfect setting for Caroline’s beautiful art. I am currently painting my college age daughter’s bedroom. She’ll be living at home when she does her student teaching and is too grown up for her high school taste bedroom. Eilis, Caroline and I thank you for your sweet comment! We hope that you are enjoying your week!!! This is a beautiful space for your daughter!! I also love your mother’s quote that our children are angels on loan for a short while. So true! Thank you, Zenda! I hope that you have a beautiful day!!! What a sweet room for your daughter, Caroline. The color is fun and vibrant. Love the chandy and the cute table. The bedding is so pretty, it just pops. I understand your concern over her weak immune system. So glad your special girl is a happy teenager. Her paintings are lovely. I hope your week is lovely Shannon. Linda, Caroline and I thank you for your very sweet and kind comment! We hope that you are having a wonderful week!!! As a mother whose children have all left the nest and made lives of their own, I can tell you, it is a blessing to see them grow into successful adults with their own families, but that doesn’t mean you don’t still miss them some days. How wonderful that you and your daughter have had this time to decorate her room together, her paintings are wonderful! Thank you so much for sharing at Celebrate Your Story! Chloe, Caroline and I thank you for the kind comment! We hope that you are having a wonderful week!!! What a wonderful room! I love the coral walls – and the stripe is a beautiful accent. Caroline’s bedding is so pretty and goes perfectly with the side table. I love the reading chair and table you added. Can’t wait to see what you do to provide a painting station/area. I’d bet Caroline gets her sweetness from you. She’s one lucky girl! Thank you, Kim, for your very sweet and thoughtful comment about Caroline’s room. We are so happy that you stopped by for the tour. We hope that you have a wonderful weekend!!! All five of our children have flown the coup and we always look forward to their visits. You and Caroline did an excellent job decorating her room and I hope she has lots of fun in her new space. I am crazy for color, so this post called to me the minute I saw it on Share It One More Time. Love the contrast of industrial and bling. I just had to pick a chandy for our kitchen remodel and that was a vibe I was going for too. So glad I saw this. Hi Pamela! Thank you for your very sweet and thoughtful comments regarding Caroline’s room. We are so happy that you stopped by for the tour! We hope that you have a wonderful weekend!!! Such a fun room for a young teen. I’m sure it’s her happy place! Thanks for sharing it with SYC. Thank you, Jann, for the kind comment! I hope that you have a wonderful weekend!!! These bright colors are so pretty. I saw a spring wreath with them and it was so cheerful. 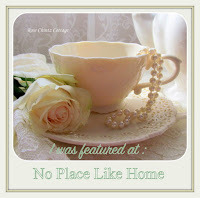 Thanks for sharing at Home Sweet Home. Thank you, Sherry! I hope that you have a beautiful weekend!! !